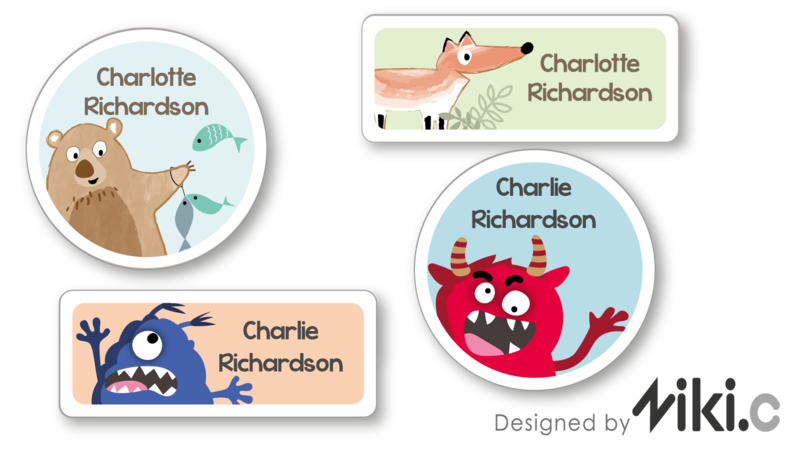 This series of delightful, quirky characters have been specially designed by artistic talent Niki.C. Using hand rendered techniques and textures, these playful and fun illustrations are perfect for labelling a range of items for daycare, kinder and school. Versatile shoe name labels designed to conveniently fit a wide range of shoes. Perfect for daycare, kinder and school. 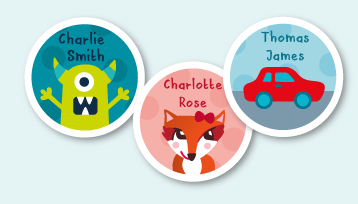 New designer round name labels perfect for daycare, kinder and primary school. Available in a range of fun designs ideal for labelling lunch boxes, hats, sippy cups, stationery, shoes and more. 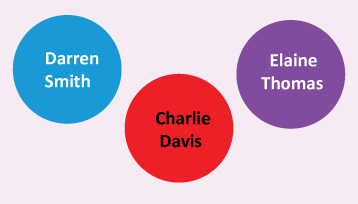 Popular animated name labels are great for labelling lunch boxes, drink bottles, stationery, hats, bottles, sippy cups and more. Perfect for daycare, kinder and primary school. Each pack includes 45 designer stickers. 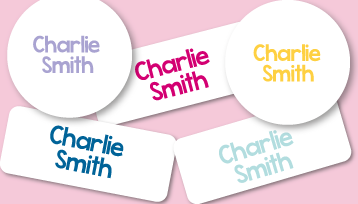 Multipurpose round name labels perfect for labelling shoes, stationery, hats, drink bottles, lunch boxes, medication and more. Includes 30 round stickers. Multipurpose shoe round labels perfect for labelling a variety of shoes for daycare, kinder and school. Ensure your child’s school books, stationery, pencils, lunch box and other belongings do not get misplaced with Cash’s printed kids name labels for school. 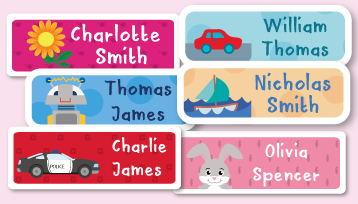 Our durable extra strength vinyl name labels for kids are available in a range of bright colours and creative icons to suit children in childcare, pre-school and older. 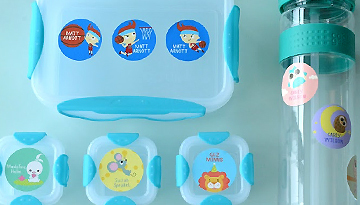 No matter how forgetful your child is, these kids school labels mean their lunch boxes, drink bottles and anything else will always find their way back. Our school name labels for kids are dishwasher and microwave safe and provide an extra strength vinyl for long lasting durability. 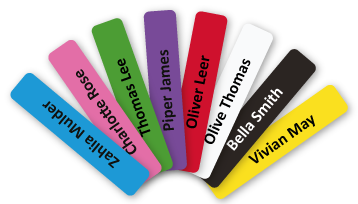 Cash's name label online range includes standard printed name labels for kid’s lunch boxes, drink bottles and stationery items; colourful and bright pencil labels and shoe labels. Our weaving factory is conveniently located in Leongatha Victoria, which means your school name labels will be mailed to you within a few working days. 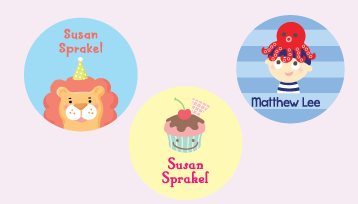 Best of all, with our cool designs, these name tags for kids are something your little one can get excited about. 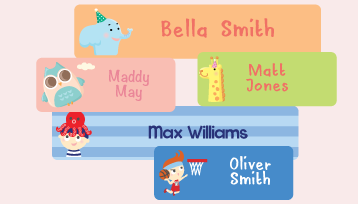 Our affordable and custom school stickers are a novelty amongst classmates, so if you’re looking for the best personalised name labels in Australia, don’t look past Cash’s Nametapes.